This book is a study of related passages found in the Arabic Qur’ān and the Aramaic Gospels, i.e. the Gospels preserved in the Syriac and Christian Palestinian Aramaic dialects. It builds upon the work of traditional Muslim scholars, including al-Biqā‘ī (d. ca. 808/1460) and al-Suyūṭī (d. 911/1505), who wrote books examining connections between the Qur’ān on the one hand, and Biblical passages and Aramaic terminology on the other, as well as modern western scholars, including Sidney Griffith who argue that pre-Islamic Arabs accessed the Bible in Aramaic. 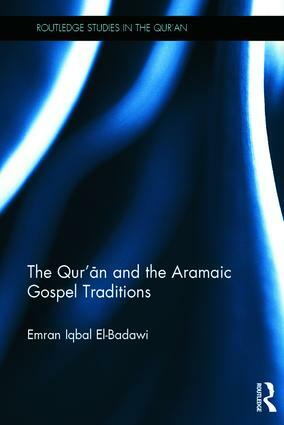 The Qur’ān and the Aramaic Gospel Traditions examines the history of religious movements in the Middle East from 180-632 CE, explaining Islam as a response to the disunity of the Aramaic speaking churches. It then compares the Arabic text of the Qur’ān and the Aramaic text of the Gospels under four main themes: the prophets; the clergy; the divine; and the apocalypse. Among the findings of this book are that the articulator as well as audience of the Qur’ān were monotheistic in origin, probably bilingual, culturally sophisticated and accustomed to the theological debates that raged between the Aramaic speaking churches. Arguing that the Qur’ān’s teachings and ethics echo Jewish-Christian conservatism, this book will be of interest to students and scholars of Religion, History, and Literature.